RFD-TV To Celebrate Hee Haw’s 50th Anniversary With Kornfield Friends During 2-Hour Special Thursday, January 31st 10pm ET / 9pm CT | 2911 Enterprises, Inc.
NASHVILLE, Tenn. – RFD-TV began airing reruns of Hee Haw in September 2008 and remains one of the most watched programs on the network. Now in 2019, eleven years later, Hee Haw is celebrating its 50-year anniversary since its first-run on CBS in 1969. 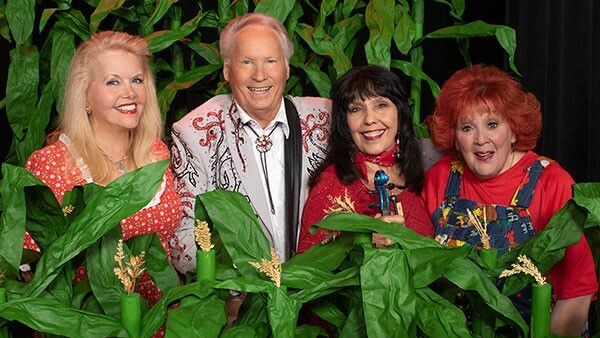 In celebration, RFD-TV will broadcast a live two-hour special on Thursday, January 31st at 10pm ET / 9pm CT that will include the Kornfield Friends – Jana Jae, Misty Rowe, Lulu Roman, and Buck Trent – along with additional cast members Victoria Hallman, Irlene Mandrell, Diana Goodman-McDaniel and members of The Nashville Edition. Country stars who appeared on the show as guests – Charley Pride, Janie Fricke, Lee Greenwood, the Gatlin Brothers (Steve and Rudy), Williams & Ree, Baillie & the Boys, David Frizzell and others will also join in during the special, plus some special call in guests! HEE HAW premieres each week on RFD-TV on Sunday at 8pm ET/7pm CT with repeats on Monday and Saturday. Hee Haw is an American television variety show featuring country music and humor with the fictional rural “Kornfield Kounty” as a backdrop. It aired first-run on CBS from 1969 to 1971, in syndication from 1971 to 1993, and on TNN from 1996 to 1997. RFD-TV began airing reruns in 2008, where it currently remains. The show was inspired by Rowan & Martin’s Laugh-In, the major difference being that Hee Haw was far less topical and was centered on country music and rural culture. Hosted by country music artists Buck Owens and Roy Clark for most of its run, the show was equally well known for its voluptuous, scantily clad women in stereotypical farmer’s daughter outfits and country-style mini dresses (a group that came to be known as the “Hee Haw Honeys”), and its corn pone humor. Hee Haw‘s appeal, however, was not limited to a rural audience. It was successful in all of the major markets, including New York, Los Angeles, Boston, and Chicago. Like Laugh-In, the show minimized production costs by taping all of the recurring sketches for a season in batches, setting up for the Cornfield one day, the Joke Fence on another day, etc. At the height of its popularity, an entire season’s worth of shows would be taped in two separate week-long sessions, then individual shows were assembled from edited sections. Only musical performances were taped with a live audience; a laugh track was added to all other segments. The series was taped for the CBS Television Network at its station affiliate WLAC-TV (now WTVF) in downtown Nashville, and later at Opryland USA in the Donelson area of Nashville. The show was produced by Yongestreet Productions through the mid-1980s; it was later produced by Gaylord Entertainment, which distributed the show in syndication. The show’s name was coined by show business talent manager and producer Bernie Brillstein and derives from a common English onomatopoeia used to describe the braying sound that a donkey makes.